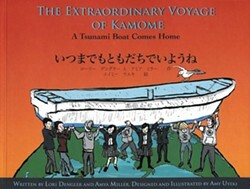 The Extraordinary Voyage of Kamome tells the story of a Japanese panga boat washed out to sea in the 2011 tsunami. A little more than two years later, the small boat washed ashore near Crescent City, encrusted with barnacles, but otherwise intact. Characters on the side of the boat identified it as the property of a high school in Rikuzentakata, Japan, inspiring students at Del Norte High School to clean up the boat and return it to its rightful owners across the Pacific. Artistic designer and illustrator Amy Uyeki's sketches are enhanced by using a Wacom tablet and stylus to draw thick black outlines and layer the colors for a woodblock-print feel. The design of this beautiful picture book reflects the journey from disaster to new beginnings. The first page is a full spread illustration of the Pacific Ocean with Japan to the east and Crescent City to the west. Light blue spaces on either side of the page hold the text in English and Japanese, introducing commonalities between the two towns. With each page, the blue tones grow darker, until the tsunami hits and the borders go black. As Kamome reaches Crescent City, the borders warm from gray to brown and finally the sunny gold of the last page. Dengler's English text has a cadence that lends itself to reading aloud. The vocabulary is accessible to second graders, but the content of the story gives it a much wider range. The story provides suspense, mystery, inspiration and humor. A section in the back of the book provides information on dealing with similar disasters. If you read Japanese, you may notice the Japanese text is not an exact translation of the English narrative — in fact, the Japanese title is Let's Be Friends Forever. 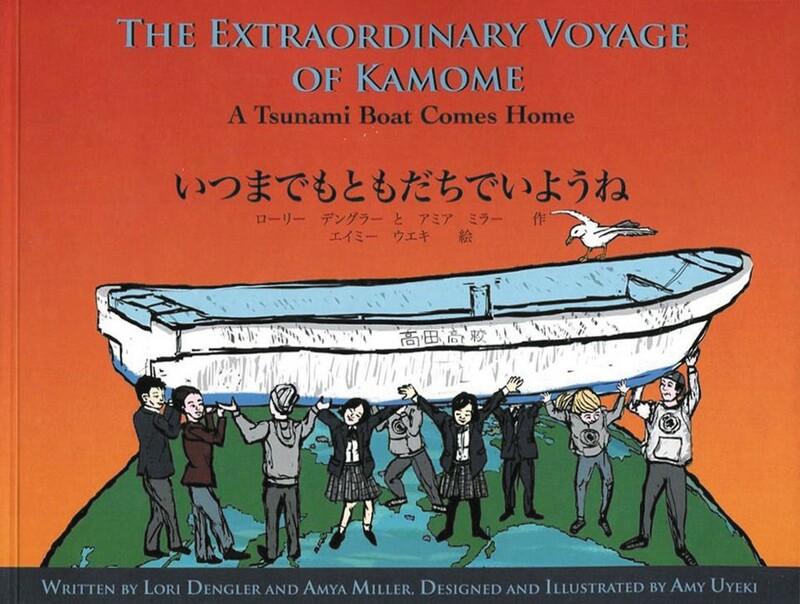 Amya Miller's translation does, however, tell the same story with sensitivity about the tsunami, which is still a traumatic reality, and an emphasis on the positive outcome of the Kamome's return. Dengler is a geophysicist who studies seismic events and the Kamome was the first verifiable item from the tsunami to arrive on the California coast — an important scientific find. It was after Dengler posted photographs of the boat on the Rikuzentakata Facebook page that Amya Miller, the Director of Global Public Relations for the town, contacted her. Miller facilitated the return of the boat and arranged for the Del Norte students to visit their counterparts at Takata High School. Proceeds from sales go toward future student exchanges between Del Norte and Takata high schools, as well as earthquake and tsunami outreach. A symbol of survival and recovery, the Kamome has been on display at the Tokyo National Museum and in Nagoya, a sister city of Rikuzentakata, and Dengler is set to speak at the Tokyo National Museum's five-year memorial event on March 11. Devastation is still widespread and while people's lives will never be the same, stories like this have the power to give hope and courage.